I've been thinking a lot lately about the digital phenomenon of publishing and ebooks. There are writers out there that don't have physical copies of their books. It is all online. They have a thumbnail cover, a pdf of their words. It could be on Kindle, Kobo, Nook or any other platform. But it isn't in print. They don't really seem to mind about this too much either because they consider that the digital platform has levelled the playing field and made it possible for anyone to publish a book. I'm not going to get into the good and bad of that today, but the way I see it, it would be a terrible shame if the future meant that we would only have digital ebooks and we lost the printed versions. If we just have digital books - which can all be deleted at the push of a button - what history do we really leave behind if all of our computer systems and servers were somehow destroyed? I'm not crying 'Apocalypse' - but technology does go wrong. How many times have you lost files due to computer failure? It only takes that one time when you forget to back up, and everything is gone. Up in smoke. Disappeared. Just. Like. That. I have always loved receiving physical copies of my books. That's the time when it feels REAL.That's when all of the hard work is rewarded. It exists as a physical thing. My baby has been truly born. I agree that we have to move with the times, but not to the point of completely eradicating this format from our world. And I really hope that will never happen. Recently I was recalling how CDs took over from records. I fought it at the time. I loved my records; I still have a player and listen to them. I like the scratchy sound. I like the imperfection. In the same way that I like the smell of fresh print. Or the artistry of a book cover that a designer spent many hours working on. I even like finding the odd print error - mistakes that can too easily be eradicated from digital versions when found. Now CDs are becoming obsolete. We download MP3s to our phones, tablets and computers. And there is also the piracy aspect to consider. Music is stolen all the time, and artists suffer from the theft. It's NOT the same as lending your friend your CD. Or sharing a paperback with a family member. That is what magazines and newspapers call 'circulation'. More people see or read something, but the actual sales are less than the readership figures. The ebook revolution has made it easier for the same pirates to steal literary works. This is NOT the same as sharing, or circulation. This is theft. It's nothing more. And although I feel that ebooks help you to reach readers all over the world, the loss of revenue due to piracy is not a good thing. And I don't believe that the people who download illegal music or books are ever going to buy further copies even if they love your work when it's being offered for free somewhere. There is a plus side to the ebook industry though: we've found new writing stars that may never have made it beyond the slush pile. Some might say that was a bad thing - but I see this as a reflection on readers' tastes and choices. Tastes that were not being addressed by the publishers out there for whatever reasons. The internet is a wonderful tool. We can expand our fan base, tell people about ourselves, but are we proper writers if our words are never printed onto crisp white pages? The authors of my youth, the books I loved and cherished, will always be immortal. I can pick their words from my shelf. They live with me in my home. If the battery runs out on my kindle then I can't use it. If I have no internet access I can't download anything. But my paperback or hardback doesn't need battery or world wide web in order for me to read it any time I wish. The signed books that sit on our shelves are cherished, beautiful and precious. They bring back memories of the meetings with authors. 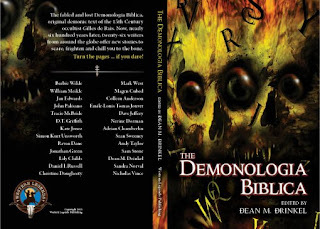 The writer's ink splashed for real and uniquely on the first page of your paperback. Now, there are apps we can download that help us obtain digital signatures of those we admire, but how can that compare to the 'real' thing? This is not a subject that will stop being explored. Or one that we can finally make a decision on. But I know that I will ALWAYS want physical copies of my books out there. And I will ALWAYS want to buy real books to read. Even if I have them on digital devices as well. Because these devices should be used for convenience but not as a way of destroying something beautiful. Without books we would have no history of the world we live in. So let's keep on publishing and printing real books. Let's share our words in all ways - but never forget the power of the written word in print. We should never give up on creating these beautiful things: they are the evidence of our existence. The beginning of the new year has brought even more good news and I'm delighted to announce that my short story URBAN WOLF was chosen for a new and exciting anthology. 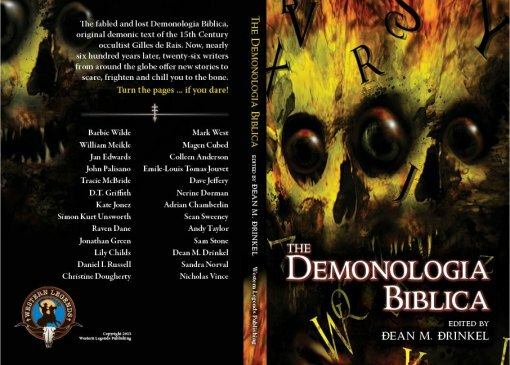 The Demonologia Biblica, Edited by Dean M Drinkel abd published by Western Legends Press, is an alphabet of chilling stories by some very respected names. My story is W for Wolf and is a werewolf story with a difference. Looking forward to reading the other stories in this collection - but for now would like to wish a hearty congratulations to everyone in there. This is a great start for 2013.